Some drinking water in Santa Rosa remains undrinkable months after the North Bay fires, and pressure is mounting on the city’s water department to locate and control the cause. 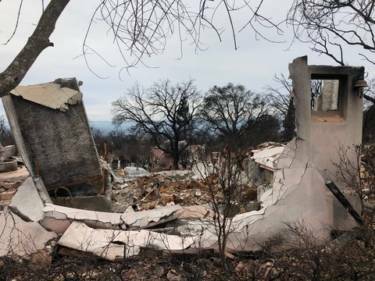 “The city is very interested to get people back and rebuilt into their homes, of course, as soon as possible,” says Bennett Horenstein, the City of Santa Rosa’s Water Director. Engineers for Santa Rosa’s water department isolated water service for Fountaingrove, in an aim to prevent wider contamination. The department ordered residents not to drink or boil the water there. Then its tests found benzene, a chemical that can cause cancer. “This contamination is certainly attributable to the fire," says Horenstein, "specifically the heating and burning of different plastic components in the system." 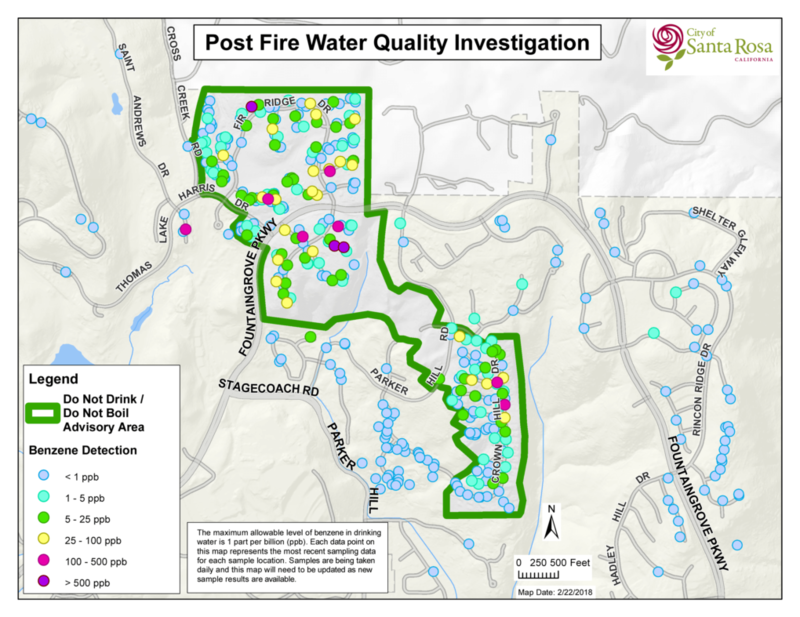 Initial sampling found benzene in the Fountaingrove water main, the local service components, and the lines that connected to destroyed properties. The city has now gathered more than 300 water samples, examining them with the help of a forensic chemist. And water officials say evidence points to burned polyethylene plastic, found in service lines to homes and other components of the water system, as a source of benzene. The service lines fed water from a main to individual properties, and melted above ground, potentially releasing toxic chemicals. The water lines in that part of Santa Rosa lost pressure in the fire, which officials say could have helped benzene to spread further when equipment melted. Test results and forensic science have made other explanations seem less likely. So far, sampling has not found petroleum byproducts in the contamination, which would be expected if the benzene came from underground tanks or soil. But samples have shown the presence of vinyl chloride, which is linked to melted plastic. “It’s a very logical source as far as we’re concerned,” says Bruce Burton, Northern California section chief for the State Water Resources Control Board’s Division of Drinking Water. California water regulations set a limit for carcinogenic benzene at one part per billion. Initial samples found 87 instances where that limit was exceeded, mostly, but not exclusively, in the Fountaingrove neighborhood. A second round of sampling in February found more benzene, including at seven locations outside the quarantined area. Horenstein stressed that the benzene in areas outside Fountaingrove was less pervasive, and had not been found in the city’s mains. Still, water department investigators now are looking for melted plastic components, benzene, and explanations in Coffey Park as well as Fountaingrove. As far as DDW’s Burton knows, plastic pipes spreading water contamination after a catastrophic fire event is unprecedented. But he acknowledges Santa Rosa’s problems may have implications for future fires in other cities. “Certainly if we were faced with similar circumstances again, we would want the system to test to see if this had happened,” Burton says. Pressure is mounting on Santa Rosa to take action for another reason too: Horenstein says testing for benzene, finding damaged water systems components, and replacing melted pipe could cost “twenty, forty, fifty” million dollars – an unanticipated cost. Santa Rosa will seek disaster response assistance from the Federal Emergency Management Agency to address this problem. But the clock is ticking. Horenstein says the city has "weeks" to wrap up its investigation, and until mid-April to determine the scope of the contamination.